Apache Axis2 is an opensource framework for webservices which is widely used today ,and its implementation is available in both java and c. Axis2 is independent of the underlying transports which takes the Messages to it.Axis2 Engine is concentrating on the SOAP processing. Users can select transports to suite their requirement and that transports are responsible for injecting Axis2Messages to the Axis2Engine.So Axis2 Engine is dealing only with this Axis2MessageContex build from the underlying transport framework. I' m writing SMS Transport as my Google Summer of Code 2009 project for Apache Axis2 which is a project focusing on implementing a SMPP support for Axis2java (And also it will able be used in Apache Synapse too Since Synapse uses the same axis2Transports ) by which Axis2 will be able to communicate with SMSCs (Short message service centers) or Any other Message centers that support SMPP . And also in this project it will make enable axis2 to communicate with Simple GSM modems. At the beginning of the Project I considered the Word "SMS" as a generic one where there can be many implementations.Currently it support the SMPP protocol to send receive SMS via Message Centers.The SMS transport is designed and implimented in a such a way that it can be easyly extended to use any other implimentations or to use any SMS message formats. Messaging Gateway.The advantage of supporting SMPP protocol with the Axis2 SMS Transport is it can be use to send receive high volume of Short messages very fast.SMPP protocal is a Application layer protocal which can be used over TCP. There are many SMPP gateways avalilable in the world.and now almost all the Message centers support SMPP.Click is a good example of a SMPP sms gateway. SMS Transport will also support send receive SMSs using a Simple GSM modems attached to the Computer.This sms implementation can be used when the data Traffic is very low.A Typical GSM modem can only handdle about 6 messages per minute.If a user need to have a heiger data Traffic with the Axis2 the SMPP implimentation can be used. SMS Transport was design to be a extensible one.where it provides proper interface to extend and reuse the current implementations. 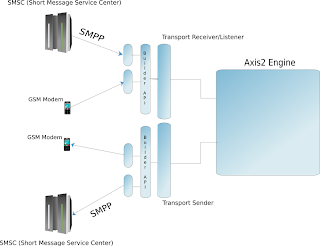 If we focus on Axis2 SMS Transport the Axis2 dependent Transport senders , Transport listeners , Message Builders , Message Formatters are put in the generic SMS layer. That layer will be depending on the underlying implementation layer which only focus on the current SMS implementation which will have nothing to do with Axis2. So the advantage is that the Developers who need to write another implementation need not to worry about the Axis2.They just need to rely on the provided API and focus on their Implementation logic. Other Extensible point of the SMS Transport is the Extending MessageFormatters and Message Builders.Users can write there own Message Builders and formatter to send receive any message formats they like by implementing the interfaces coming with the SMS Transport. This blog is only a overview of the Axis2 SMS Transport and there will be documentation coming explaining the configuration , and extensibility of this Transport.